Welcome to this month’s Blogorail Green Loop. Today we are sharing some of the best drinks you can find at the Disney Parks & where you can find them. Welcome to Germany! Home of great food, great drink, and great entertainment! 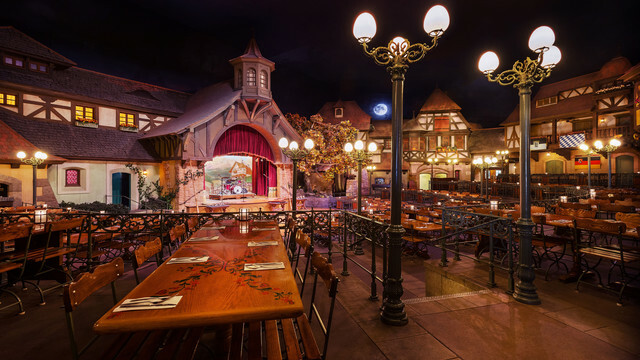 Today, my friends, I am traveling a bit out of my comfort zone to talk about the best Disney drink that I have to have when we eat dinner at Biergarten. That drink (or, if you will, series of drinks) is the German Beer Float. I say that I’m heading out of my comfort zone because, truly, I am rarely an alcohol drinker — and as such, the German Beer Flight is the perfect amount of alcohol for me! Still 5 ounce tastings, so that is the same, the price for the current evolution of the Beer Flight is $13. Before, I was a big fan of the Oktoberfest — and since that hasn’t changed, I imagine I will still be a fan of that. Of the four of those, I think the Pink Grapefruit Hefeweizen would be the one that I would dislike the most — or perhaps the Dunkel. I’m not one for a dark style beer so that one may be the one I dislike. If you have a fancy for one of these, you can also order them individually in 1/2 liter servings — the two Hefeweizen varieties are $9.50 each, the Oktoberfest is $8.75, and the Dunkel is $8.25. Sophie and I on the dance floor. 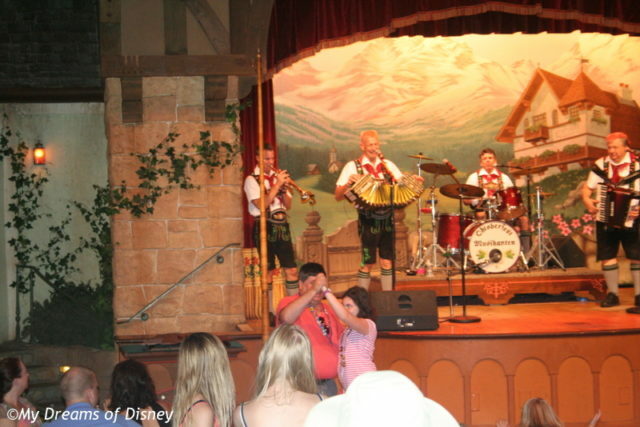 So, my friends, this concludes my look at the German Beer Flight, and why this is my choice for the Best Disney Drink. I hope that you have enjoyed my look at the drink, as well as my look at why this one simple drink really does it for me. Until next time, please go out, have a great day, and remember to make it a Disney day no matter where you are! Thanks for stopping by, go check out the rest of the posts below! 1st Stop – DISTherapy | The Iconic Lapu Lapu from Tambu Lounge | And How to Make Your Own! Sounds like a great treat for beer lovers! Thanks for commenting, Lynn! I thought it was a great way to sample different flavors to see which one I liked best. So how was it, Didi? Did the pink grapefruit deliver? Thanks for the comment! I don’t spend much time in the German pavilion, but when I do – I always make sure to get the Schöfferhofer Pink Grapefruit Hefeweizen! I fell in love with it during the Food & Wine festival, but as a big beer fan the next time I visit I may just have to try the whole flight. Great comment, thanks Morgan! I’m going to reserve judgment on whether I would like the Pink Grapefruit until I’m there next and can sample it. Thanks again for the comment! I usually get the wine flight. They change the wine offering quite often so every time I go back I try something new. My husband usually does the beer flight and ends up getting a ‘big beer’ too! I just like to chant with the band and have some delicious food! This place is one of the most fun places on property! Next Post: Happy Birthday Donald Duck!